The Subzero Research Laboratory at Montana State University was recently featured in National Geographic's “Explorer” television program, highlighting the lab's important role in advancing snow science. "This 2,700-square-foot facility is one of the leading cold science research centers in the world," the show’s host says in the segment. The roughly eight-minute segment, titled “The Secret of Snowflakes,” includes footage of MSU researchers using the lab's specialized equipment to study the factors that can cause a snowpack to avalanche. "You've got a strong layer, a weak layer, and then a strong layer on top — that's a recipe for an avalanche," says Ed Adams, a recently retired MSU professor of civil engineering, in an interview in the segment. Ben Reuter, a post-doctoral research scientist at MSU, is shown in the Subzero Lab's environmental chamber, where the temperature of the floor, ceiling and walls can be controlled to simulate a natural winter environment. Reuter shows the “Explorer” host the equipment that the researchers use to make artificial snow. Reuter, Adams and Subzero Lab director Kevin Hammonds, assistant professor of civil engineering, are shown looking at detailed images of ice and snow crystals taken with the lab's powerful microCT tool, a smaller and specialized version of the CT scan technology used to see inside the human body for diagnosing illness. Also shown are Neige Calonne, a visiting researcher from France who was working with Adams last fall, and Trenton Aeillo, a freshman majoring in earth sciences. With funding from MSU's Undergraduate Scholars Program, Aeillo is conducting research with Hammonds about surface hoar — delicate ice crystals that, when buried by additional snow, become a weak layer that can cause an avalanche. "By studying the mechanics of a snowpack and the snowflakes inside it, Dr. Adams's team is trying to improve avalanche prediction in order to save human lives," the “Explorer” host said. In the show, the host asks Adams whether he can imagine a software tool like Google Maps that can predict avalanche danger with higher resolution than current forecasts. "Yeah, we can get closer to that," Adams says. 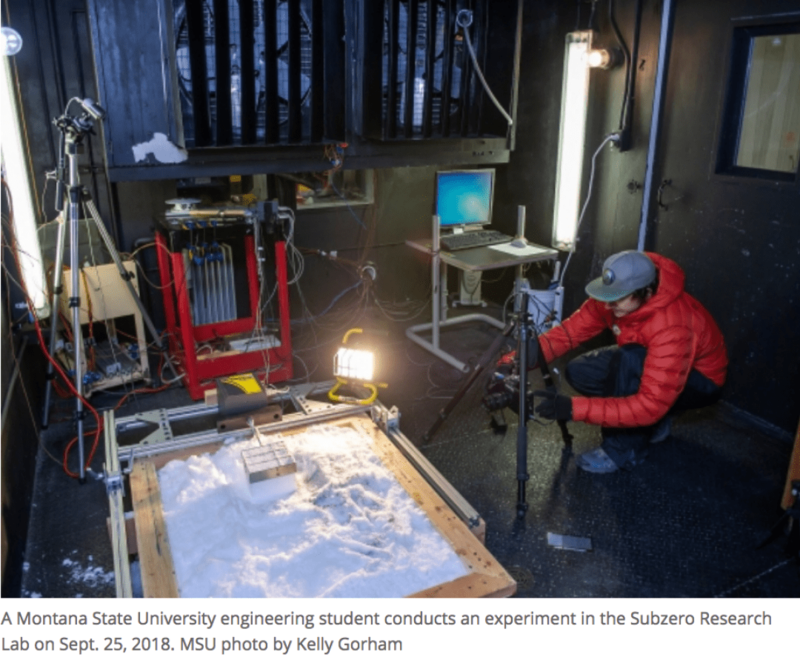 The Subzero Lab, which is housed in the Norm Asbjornson College of Engineering, is used by MSU researchers from across campus, including by snow scientists in the Department of Earth Sciences and polar researchers in the Department of Land Resources and Environmental Sciences. The segment aired on “Explorer” on the National Geographic channel on Dec. 17 in episode six, titled "The Boiling River," which is available for viewing at www.nationalgeographic.com/tv/explorer.